Seven Acres Glamping nestles in a beautiful secluded spot in the Cotswolds and close to the lively market town of Stroud with all mod cons. It’s a place to unwind and forget those workaday worries. As soon as you arrive at our Cotswold glamping haven, you’ll feel right at home. Seven Acres’ beautiful rural setting is truly a place to feel at one with nature. What’s more, everything you could possibly need is within an easy 20-minute drive, whether you’re interested in arts, history, food, or shopping. Richard and Rose with daughter Karen and son Matthew live and work on site. You’ll see the chickens roaming around and their freshly laid eggs are available for you to buy. Also on sale are plants so you can take a little bit of Seven Acres with you when you leave. 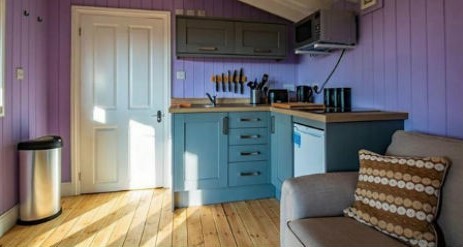 We have two lovely wooden lodges, Butterfly sleeping 4 and Squirrel sleeping 2 as well as our beautiful gypsy caravan, Rose. Each accommodation unit enjoys its own little piece of our Cotswold home. When you arrive at Seven Acres Glamping, you’ll find your accommodation fully prepared and ready for your stay, with a Wake Up Pack including milk, bread, and eggs freshly laid by our own hens, so you don’t need to make any last-minute trips to the shop before you kick back and unwind. 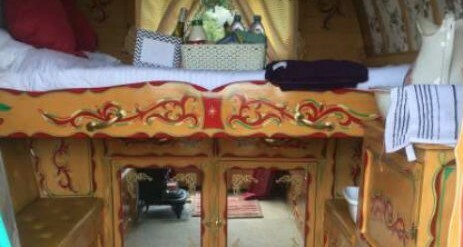 Our gypsy caravan, Rose, has stunning carved details and an authentic Romany flavour, and is perfect for two people. 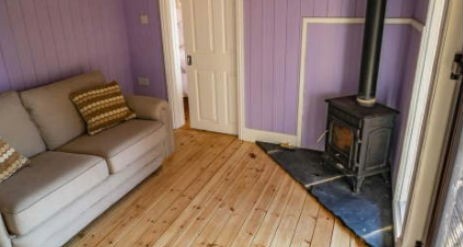 The lodges have their own private toilet and shower room – we’ve even supplied shampoo in case you left yours at home… The gypsy caravan shares the basic facilities block of the campsite. We also offer traditional camping and caravanning at our adjacent campsite with basic facilities, for camping aficionados who think glamping is cheating! Whilst we welcome everyone, Seven Acres isn’t ideal for stag or hen parties – but it may be the perfect location for a family get-together or reunion. 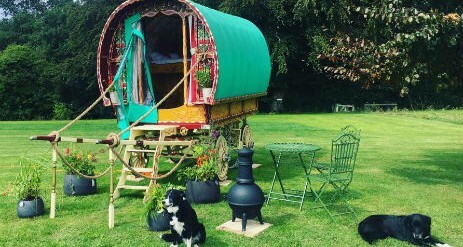 When it comes to glamping in Gloucestershire, Seven Acres enjoys the very best setting, marrying a rural idyll with easy connections. Our local pub, the Butchers Arms, is a traditional Cotswold inn with plenty of personality, top-notch ales including local brews, and superb fare that’s definitely a cut above. What’s more, it’s only a short walk from our site, so you can stroll down and make a night of it. 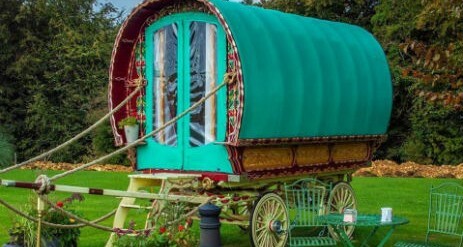 Our two-berth gypsy caravan is priced from £60 a night. 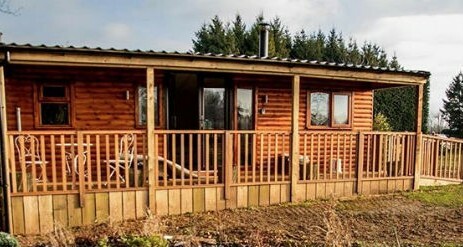 Our accessible four-berth wooden lodge, Butterfly is priced from £70 a night at the moment as an introductory offer whilst building continues with our other lodges.